A lovely three bedroom cottage with a family room, living room on second floor, gas fireplace, basic cable, three decks, and walking distance to beach, Downtown, and restaurants. One queen size bed in each of the three bedrooms with ceiling fans in each of the rooms. The living room on the second floor has a futon and a couch to sleep on. The family room on the first floor has a pull out couch with a full size bed. A corner home in Port Austin's Village, with a freat view of the lake from the kitchen table, in the Bird Creek Subdivision across the street from Lake Huron. Located 2 hours North of Romeo off Van Dyke 53 Hwy. Enjoy the Farmer's Market every Saturday (Memorial weekend-Oct) from 9:00am-1:00pm offering fresh produce, desserts, preserves, flowers, crafts, woodworking, books, antiques, raffles and music. Rented weekly during high season June-August. Available for weekends during off season. If cottage is desired for a weekend during the high season, call two weeks prior to for availability. We build our dream home and now wish to share it with a few people. It's filled with hardwood floors in the main areas and carpet in all the bedrooms. A second floor TV room for kids or quite reading time. Lots of Windows & fans in every room keep our place cool during the day. Decks in front and back allow for views abound in beauty. This property is in a paved sub that is walking distance to public access, town and beach, or fishing and swimming. 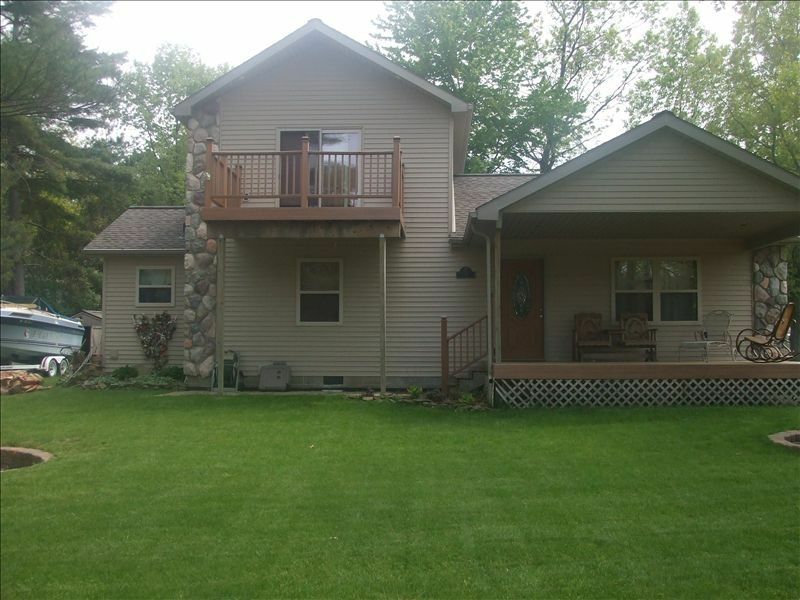 Gentle breese off the water and great view from the front porch overlooking the water. No fast food or traffic jam here. First floor Italian tile with tub and shower. We live in Bird Creek Sub on a asphalt road with many homes. We have a beautiful view of Lake Huron from our front porch. We positioned our place to see the water edge from the kitchen table. you can see the harbor entrance while drinking your morning coffee. You can walk or drive to many public access points to see breathtaking sun sets. Also the 1 mile long walk on the pier at sunset is great exercise. Basic with sports channel available. Shed in yard has kits, games and floatie's for kids. You take it out please put it back. Kayak rental a short walk away. Boat storage at state dock. Covered front 18' x 16' porch with a view of water. Rear has outdoor seating for 6 +. All decks are Timberwood Plastic manufacturing type. Stairs all around. Handrail on back only. Wonderful vacation rental close to beach and downtown area. House was clean, comfortable, and was equipped with kitchenware, linens, and house supplies. My family stayed here a week and it was the best! The house is beautiful and the location to the city is great! Thanks for everything! Thank you for your response. It is appreciated. Not sure how many more years I will rent, but its getting close to stopping in a year or two. Keep my number and we can always talk if interested we will work something out. My family absolutely LOVED the cottage! It was very spacious so we didn't feel like we were tripping over each other, and the second bathroom was a huge plus! The location in the sub was terrific; beautiful views of the water across the street from the porch and living room. We enjoyed hanging out catching the breeze off the water, around the fire pit, and at the beach. We definitely would stay here again! Our location is within the township. A short walk to town or the beach. The Port Cresent Day park is about 5 miles west on US 25. Canoe Rental is available on the Pinnabog River which takes you out to Lake Huron.